The answer to that question is multi-fold. We’ve all seen ‘Joe Neighbor’ who thinks he can do it all himself. He’ll either try to repair his roof or build a garage or some other such endeavor that takes professional skill, and he’ll botch the job, lose money, and possibly injure himself in the attempt. It’s that know-it-all attitude that gets many site owners in major trouble because they think they can do SEO all by themselves and not hire a professional SEO firm. An SEO specialist knows all the ins and outs of the SEO industry. It’s both an art and a craft and calls for multiple educations in technical and historic. The history of SEO is only about 20 years old but it is intense to say the least. SEO is one complicated and long term project. Your site just doesn’t stay static as if once you’re done constructing it, search engines are going to beat a path to your door. It doesn’t work that way. It takes expertise on a fine level to get each page of your site indexed and indexed properly. Google doesn’t index sites, it indexes webpages, so each of your webpages has to be SEO’d to the nth degree, not just your first page. The SEO professional will know what keywords to use and where to place them. They’ll use specialized tools to find the best keyword matches that will gain you the most ground. They’ll check on your competitors to better give you a fair playing field and this task alone is worth the money you’ll pay them. 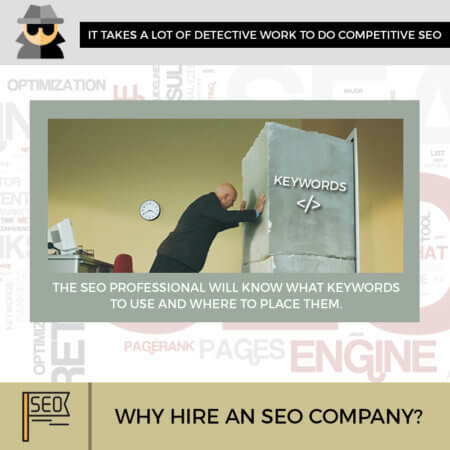 It takes a lot of detective work to do competitive SEO. The variables involved are so many that only a trained eye can decipher them and make the right course corrections. Here’s where the SEO consultant comes in. When you’re looking to hire an SEO firm, the honest ones have a consultant on board who will walk you through every aspect of SEO. This is so to better educate you regarding what they’re going to be doing and why. Some of what they’ll discuss may be too technical at first, but a pro will know that and try not to make things too difficult. They’ll guide you through how many team members will be involved, what type of tools they use, the time factor, and a reasonable idea of when you should see results. Of course they’ll talk to you about costs but they’ll try to get you the most for your money and when they get the project going you should see a significant ROI than had you risked all and tried to do it yourself. It’s fine to have the gusto to want to take responsibility and get things done on your own, and yes, there are some fundamental things you can do with SEO on your own, but if you’re in a highly competitive field you had better get yourself an SEO specialist from an SEO company and do so fast. Next PostNext Is There A Smart Way To Do Backlinking?